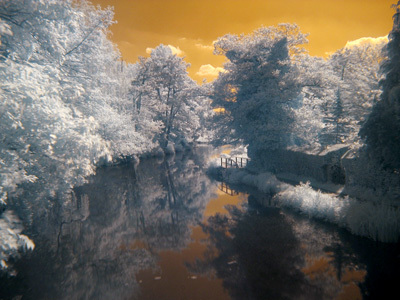 Infrared 100: What colour is the sky in your infrared world? What colour is the sky in your infrared world? The three colour filters on the sensor will pass near infrared light but in differing amounts and that results in what seems to be a colour picture. I call this faux-colour to distinguish it from the false colour that infrared Ektachrome produced. Here the colour balance has been adjusted slightly to make the foliage appear white/grey but even without this change the sky is a reddish-brown colour. If you don't like this you can change it since there is no correct version of this colour arrangement, it is purely an artefact of your camera's Beyer filtering when confronted with near-infrared. There is an alternative way, which is quicker and produces slightly different results. If you convert the image from RGB into LAB colour then you can invert (make negative) the A and B channels to change that reddish sky to a blueish one. Neither of the A or B channels has a red-blue axis. Red-green (A) and yellow-blue (B) are the axes of the components: colours are defined by their position along those two axes (and the L is the luminance or brightness). So now we have three ways to post-process the faux-colour images. My personal preference is for the one with both LAB colour components inverted, but your mileage may differ.